As already mentioned; a truly impressive public aquarium that shows the beauty and the splendour of stony corals. It certainly rivals the best private aquaria. 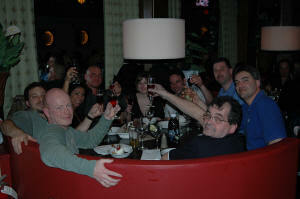 During the previous year, I found out from Joe how it had all come about. Joe had been active in the hobby for years, and one day he was asked by a friend (the founder) if he thought whether what worked well on a smaller aquarium was possible on a larger scale, and if he thought that he was capable of pulling it off if the funds were available. After he said he thought it was possible, they began the plans for an 80,000 litre reef aquarium. 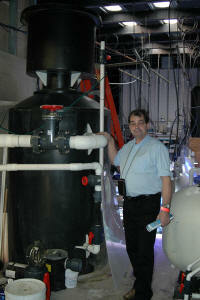 Joe engineered & developed the aquarium and has played a prominent role in all it’s maintenance activities. 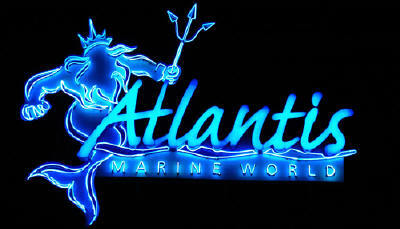 Today, Joe is curator of the aquarium and has become a full-time supervisor of Atlantis Marine World. The 80.000 litre reef aquarium has two main viewing windows divided by a center pillar. 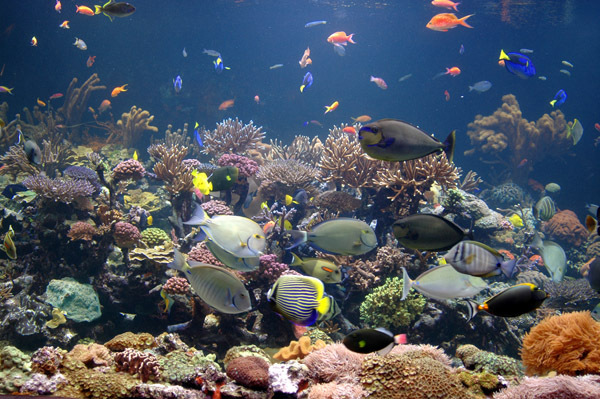 The aquarium is, in fact, a large version of a reef aquarium that you could have at home. The outside aspect is split up by a pillar on the outside front wall, on which an information board is displayed dividing the length. The aquarium is 7 meters and 50 centimetres long, it has a depth of 3 meters and fifty centimetres and a total water height of approximately 2 meters and 95 centimetres. The viewable area has a height of 1 meter and 62 centimetres. The water volume in the main tank is approximately 77,000 litres. The sump has a volume of approximately 3000 litres. The total volume of marine water brings it to an impressive 80.000 litres. The external design has also been well fabricated, and theme is the lost city of Atlantis. That is not a trick! The custom skimmer is really almost twice as tall as Andre! 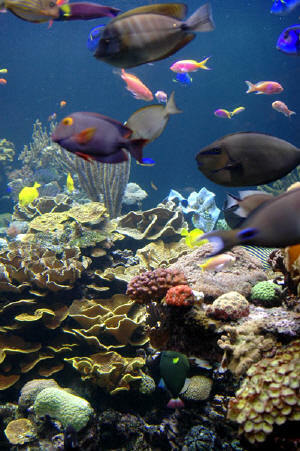 The aquarium uses several filter techniques. There is a custom designed skimmer running; unfortunately there was not enough time to write down the exact dimensions, but the photograph shows how big this skimmer is. The skimmer has 2 large venturies approximately 25 centimetres long, they work using two Mazzei venturi injectors. Five PacFab Challenger pumps have been connected to the skimmer. As a mechanical filter, a sand filter has been used. The sand filter can helps to reduce nitrate, and to filter the water. Once every couple of weeks, the sand filter is rinsed and cleaned. Ozone is injected into the water, mainly to keep water clear and reduce the yellow colouring produced by the waste of the many fish. This prevents the light penetrating the water as a side effect enough to affect the corals. So, clear water is important and considering the tank has so many daily viewers. There is also activated carbon filtration used, the custom made unit has a diameter of 18 inches and contains 15 gallons of carbon. The flow through the unit is 900 gallons per hour and the carbon is replaced every two to three months. There is 10,000lbs of live rock in the aquarium from Fiji and Tonga. There is also 30,000lbs of terrestrial rock from Eden Stone, Wisconsin. I think this choice was made due to the many minerals the rock contained. The spectacular Aquascaping is provided by large dead stag-horn corals. On the bottom lies a layer of fine sand mixed with course coral. The depth varies from 2.5 centimetres up to 15 centimetres. If you have the opportunity to look behind the aquarium and you’re able look down at the water’s surface, your reward is a spectacular view. At the same time you will encounter the many light pendants in use. 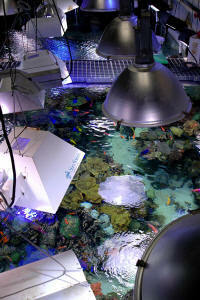 Many metal halide pendants are required to provide enough light for this huge reef! The pendants hang at several heights; this is to allow different places in the aquarium several light intensities. This allows a variety of different animals different optimal regions in which to grow. For soft corals, lower intensity lightning and for small polyp stony corals a region of high intensity. There are 12 pendants, each containing 1000 watt HQI bulbs. These are 6500 Kelvin and burn for 10 hours. Also there are 6 pendants which house 400 watt bulbs. These are also 6500 Kelvin and burn for 11 hours. There are also four more pendants each containing 1000 watt 20,000 Kelvin bulbs; these burn for 12 hours. The 400 Watt halides hang 12 inches above water, the blue lamps hang approximately 23 inches above the water and the twelve 1000 Watt pendants hang at alternating heights from 23 up to 36 inches above the water. Together this is a considerable wattage: 18,400 Watts burn 20.000 gallons giving a wattage of 0.2 Watt per litre of marine water. That stands in striking contrast with the common advice that one must have more than 1 Watt for every litre of marine water. This is a false argument that so much light is needed. 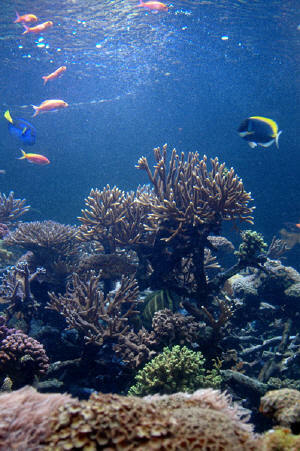 In fact, to have that much light above animals for 8 to 12 hours per day can cause severe damage to the corals. In nature the light peak is about 3 hours. High wattage lamps have their functions in aquariums with a water height of than 60 to 70 centimetres or more. But for aquariums which have a water height of 40 to 60 centimetre lamps such as HQI 150 or 250 Watts and T5 lamps are quite suitable. The light spectrum of the bulb and the quantity of PAR (photosynthetic available radiation) is much more important. It is hard to imagine that these photos are of a captive reef system and not the ocean! As a final note in this particular large & deep aquarium you don’t see the pastel colour corals but very healthy corals with natural colours as they occur in some deeper waters of let’s say about 5 to 15 meters, the growth in the tips a beautiful colour. The daylight lamps are replaced every twelve months and the blue ones every 8 months. The animals in the aquarium are seen in impressive numbers. Due to the format of the aquarium you can observe several types of natural behaviour in many species - fish that remain in schools and swim gently without stress in the aquarium. Splendid to observe! The size, numbers and diversity of fish and corals in this tank are well beyond what can be achieved in a home aquarium! Here you can observe fish that normally don’t gain their natural size in captivity at their full natural size. It’s also clear to see that territories are both horizontally & vertically defended. 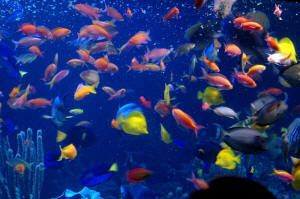 There are approximately 800 fish in the aquarium; it was a real joy to see it. This reef is alive and always attracting your attention! There are also approximately 450 stony corals from so many species that I didn’t even bother to write them all down J and approximately 200 soft corals of which some are huge! 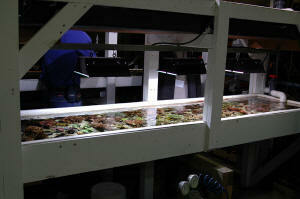 We also checked the coral propagation room which highly interested Julian Sprung. As the daylight intensity diminishes, and the blue lamps remain on alone several species show sexual reproductive behaviour. On Saturday night during the dinner many gazed at the glass to observing this. Reproductive behaviour was observed amongst others such as Tridacna, Chromis and Anthias. Many people tried photograph this behaviour however in a dark scarcely lit tank very fast and sudden moving fish make this nearly impossible. Julian Sprung did his considerable best to photograph two flag fish’s coupling behaviour. I didn’t see the result; I’ve never managed under any circumstances to succeed at it myself! Feeding time! For the fishes and for the guests! The information regarding the total water turnover in the tank wasn’t available to me at the time; however I can tell you that about 20,000 gallons of water are circulated constantly with the full volume being turned over 7.5 times per hour.